Process Mapping or Value Stream Mapping as it is commonly called, is the exercise of recording on paper with flowchart symbols (or any symbols that you’re comfortable with just a long as you actually do it) all of the steps in a process. It’s called Value Stream Mapping because the idea is to use the analogy of a flowing stream of water to capture the essence of what you are trying to accomplish. As anyone knows who has looked at rivers, dams, overflows, or any watershed, sometimes the water flows and sometimes it gets stuck in large reservoirs. Now, whereas the reservoirs are terrific for water supplies, they are not terrific for process flows! They get in the way. They cover things up. They generally cause or enable chaos within the flow. The Mississippi River ends south of New Orleans by emptying into the Caribbean Ocean. In the vernacular of Lean Thinking, this is delivering value to the final customer… this is the ONLY place “Value” actually counts. 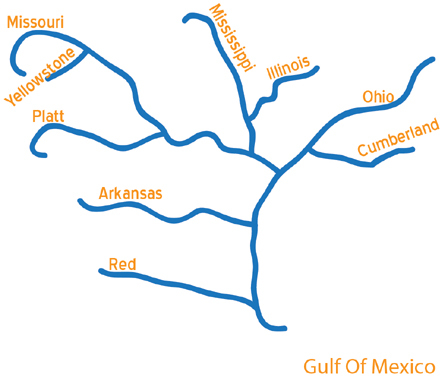 As you leave the Mississippi River proper and go out into its major tributaries all the way up into the Appalachians, Rocky Mountains, and the North Central States, you will find sequentially smaller drainage ways: major tributaries; minor tributaries; streams; rivulets; and brooks. There are thousands of specific valleys that produce streams that gradually confluence together into what we call the Mississippi River to “deliver ‘value’ into the Gulf of Mexico.” This is basically an “A” flow module. (Please see the AVIT Flow Modules article) Along these waterways, there are naturally occurring lakes as well as hydroelectric dams. Sometimes the water flows in a nonstop fashion, and sometimes it waits in “Flow-In-Process” inventories that we call lakes and reservoirs. Whereas these lakes, reservoirs, and navigable waterways are desirable and useful in a watershed, their analogies of piles of Work-In-Process Inventory in a physical or informational process flow are not desirable. All they do generally is get in the way, and prevent smooth delivery of “Value” from that process. Work-In-Process Inventories that are too large also hide ill-conceived tools, methodologies, and work-arounds in multiple locations along the way. – Do this with pencil, not on a computer screen. – Do it on a size of paper equal to either the European A3 or the US 11 x 17 paper. – If you can’t fit it on to an A3 or an 11 x 17, you are putting on too much detail or you’re looking at too big of a project. – Actually do it… one person… from beginning to end. The major problem that the value stream mapping solves is that no ONE person actually KNOWS the steps all the way from “door to door” for a given process in your organization. Each department or each “operator” knows their part of the process inside and out, but they don’t look more than one department up or down stream, because they get in trouble if they do! – There are a number of notations that are useful as illustrated in the Learning to See workbook. However, don’t get so hung up on getting the symbols “right” that you freeze up and don’t do the flowchart mapping. I have done mapping with and without the LEI symbols. The point is for everyone to have a common “sheet of music” to talk about, point to, and to ask questions about. Whichever format you choose to do your flowchart in, you can always add information later such as wait time, cycle time, Throughput Ratio (Total Processing Time / (Total Processing Time + Total Wait Time)) number of operators, and any other setup or operational information. However, if you never actually record the flow, you will not ever have these opportunities to capture this information, much less actually showing it on the sheet of paper so that people can talk about it. If you never talk about it… it will NEVER change. There are two main phases of Value Stream Mapping. The one I just talked about is the creation of the “Current State.” The next major phase is to look at the biggest constraint in the Current State and decide which projects are necessary to eliminate Work-In-Process Inventories (great big reservoirs)… or other even bigger impediments (such as outdated Policy & Procedures for example). Then, redraw your Current State Map as if the major changes were already accomplished. This is your “Future State Map” and is what you are trying to accomplish in this iteration of your flow. Note that according to the Theory of Constraints, you should not just be trying to improve any random process flow…. You should be identifying and solving the largest constraints on the single process flow that constrains your entire organization! The TTZ is an excellent guide to identifying this overall system constraint… whether it lives in the blue-collar areas or in the white-collar areas. Also, please see the articles in the Schools Of Lean Implementation as guides on how to respond to the TTZ constraints that you find. N/A Perfection (Do the first four over again!). The large majority of the time you spend in these improvement processes will be in rearranging the Flow of your processes to implement your Future State Map. A critical factor to realize, even in the throes of your initial value stream mapping exercise, is that this is not going to be perfect in one shot! See the Sluice Analogy and Helix articles for an explanation of this statement. PLEASE… PLEASE… DO NOT EXPECT TO BE PERFECT IN ONE SHOT… this expectation will do nothing but stop you and your organization from improving!